No matter where you are on the political spectrum, you probably have respect for the power of the vote. Both the U.S. Elections of 2000 and 2004 made it very clear that even small numbers of votes can vastly change an election’s outcome. And yet, U.S. turnout rates, especially for non-Presidential races are low; 64% in 2004 and only 46% in 2002. Like all good habits, including tooth brushing and flossing, early practice is the key. Kids who participate in voting, will likely be voters when they grow up. And participating can actually mean being with you in the voting booth pulling the levers or pushing buttons. 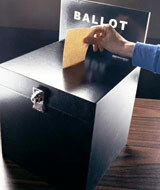 Most state laws say that children under age 16-18 may accompany a parent or guardian into the voting booth. The only requirement is that parents must supervise the children so that they do not interfere with the voting process. Check your state for the exact rules (see below for a few examples), but it makes sense that the law encourages parents to get to the polling place, even if kids are in tow. Dads who make a special event out of going to vote with their child create an opportunity for a short lesson on civics, personal responsibility, and the power of the individual in society. The younger kids think the process is fun and almost everyone loves the sound of the clunky levers in the big polling booths, if you’re lucky to still have those where you live. If you have older kids, you may even enroll them into helping you decide on the tough races based on your family’s beliefs and values. In Tampa Bay, as well as in many other cities, Kids Voting is organizing polling stations for kids at local polling places so kids can vote alongside adults. For more information visit: http://www.kvtb.org/precincts.htm. For other “Kids Voting” affiliates in your area that may be doing other activities for kids, check out http://www.kidsvotingusa.org/page9624.cfm. Here’s an example of the ages children are allowed in voting booths. Make sure to check the ages in your state so that you can refer to the law if someone objects.